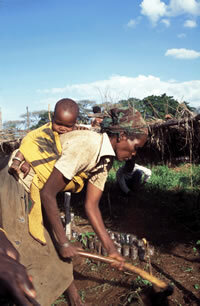 Agricultural production in Africa has largely remained in the hands of small-holder farmers. The problems facing the African continent, especially the sub-Saharan region, are enormous and demand urgent action in order to avert impending tragedy. With a population of well over half a billion, which is still growing rapidly, increasing poverty levels, food insecurity, health and human well-being problems of disturbing proportions, and crumbling economies, the region presents a picture of misery that is a blight on modern civilization. Yet it is a certain fact that the region is well endowed with human and natural resources, which if properly harnessed and managed, shall usher in an era of development and prosperity that will make the region less of a liability to the developed world. Of particular concern is the food and agriculture situation in sub-Saharan Africa, where food production levels are critically low in relation to the population. It is a well-known fact that the specter of hunger and famine hangs over the region in the foreseeable future if drastic ameliorating actions and initiatives are not undertaken. Agricultural production has largely remained in the hands of peasant small-holder farmers, who use traditional slash-and-burn, low-yielding modes of production, with outputs that at best satisfy subsistence levels. In some cases, modern agricultural methods have been introduced by multilateral, donor and non-governmental agencies. However, short-term gains that are recorded often evaporate at the end of the intervention period because appropriate technologies have not been transferred to or understood by the local populations. The combined effects of traditional modes of production and ill-transferred technologies are manifested in continuing low productivity and environmental degradation. Thus, the cycle of poverty and hunger continues. Africas Hunger Crisis: at least 38 million people in the countries highlighted above are suffering exceptional food shortages. In light of the scenario described above, the CHEMRAWN Committee believes that an effort should be undertaken to transfer proven chemical and soil management technologies to Africans. The idea is to impart to African people the knowledge and dynamic approaches that will help them anticipate problems and evolve timely solutions for creating sustainable agriculture, thereby raising the standard of living, especially of the rural majority. Consequently, the committee has approved CHEMRAWN XII, a Conference on Chemistry, Sustainable Agriculture, and Human Well-Being. The conference is intended to motivate sustained action so that over time, indigenous capacity can be built among the African people to ensure food self-sufficiency and food security in the long run. CHEMRAWN II, a forerunner to this conference held in 1982, addressed the issue of "Chemistry and World Food Supplies: The New Frontiers." CHEMRAWN XII shall integrate recent advances in increasing food production with careful and responsible care of the environment, especially as applied to Africa. Distinguished scientists and professionals from Africa and beyond who have contributed to the development of sustainable agriculture and responsible natural resource management will present plenary and invited papers. Scheduled lecturers include Thomas Odhiambo (Kenya), Francis Idachaba (ISNAR, The Hague), Avilio Franco (Brazil), Rattan Lal (USA), Christopher Chetsanga (Zimbabwe), and Patrick Ngoddy (Nigeria). A decision shall soon be made about whether South Africa or Senegal will be the conference venue. The First Circular shall then be distributed with all the necessary details.